Can't make it to Cancun for the Triathlon World Championships this year? Not a problem. 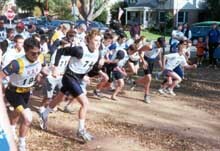 Racers can join the athletes and friends of the Bethesda Center of Excellence (BCE) for the 14th Annual BCE Whitewater Triathlon in Bethesda, Maryland on Sunday, November 10 from 10:00 a.m. until noon. This is a Triathlon of sorts, featuring a run, bike, and whitewater canoeing and kayaking down the Potomac River. The tradition of the BCE Whitewater Triathlon began as yet another way for whitewater racers to compete against one another as they began their autumn endurance and cross training conditioning. Incidentally, the swim, bike, run Triathlon was created by the San Diego Track club in the early 1970s also as an alternative workout to track training. The BCE Whitewater Triathlon features about a 3.5 mile Run, 4 mile Bike, and a 3 mile Canoe or Kayak paddle down the Potomac River and the class III-IV Whitewater of Little Falls. Previous Whitewater Triathlon times range from 78 to 120 minutes depending upon the Potomac River level. Individuals may compete in all three events, or any combination of two or three people can make up a Relay Team. Previous entries include: Men’s and Women’s classes: Junior 18 and younger, Senior 19 to 34, Master 35 plus. Mixed Relay Teams, Men’s Teams, and Women’s Teams. Don't worry, if you are missing a Relay Team member we will try to match you up with someone on race day. The entry fee is $20 per person (plus $5 for non-USA Canoe Kayak members) payable to the BCE. Please visit the BCE website at http://ccadc.org/bce/02BCETRI.html to print the Triathlon entry form and two waivers. Please snail mail all signed forms and fees to: BCE Whitewater Triathlon, 6211 Ridge Drive, Bethesda, MD 20816-2641. Please also consider adding an optional year-end, tax-deductible contribution written to the BCE remembering that all proceeds will support training facilities and athlete programs - Thank you to everyone who has supported the BCE in 2002. The Bethesda Center of Excellence, BCE is a United States Whitewater Canoe and Kayak Team Training Center, the Whitewater Racing Program of the Canoe Cruisers Association, and a nonprofit 501(c)3 organization. The mission of the BCE is to provide high-quality, year-round whitewater training facilities, coaching, training camps, and support to all actively training and racing whitewater athletes. U.S. Wildwater Team member and Eastern Athlete rep Middy Tilghman leads the start of the 2000 BCE Triathlon. 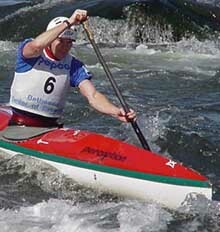 U.S. slalom legend Davey Hearn blitzes down the triathlon's river leg in a Wildwater boat. If you are unable to compete in this year's 14th Annual BCE Whitewater Triathlon, you may wish to VOLUNTEER as a: Timer/ Registrar/ Safety Boater/ Photographer/ Equipment Guard/ Course Set-up or Take-down Helper. Please indicate your preferences and reply to Jennifer at DHearnC1@aol.com. Thank you! Jennifer Hearn is the BCE Whitewater Triathlon Event Chair and lives in the Washington, DC area. Reach her at DHearnC1@aol.com.